Filipino recipes is really my favorite. Humba is one of the dishes I prepared during our recentsalo-salo (get together) with friends. Everyone loved it. I even heard one of them that he missed it a lot. They were quite surprised upon seeing potatoes and hard-boiled eggs sitting on the dish. I’ve got this idea by my mom’s friend, a kusinera (a househelp main job is like a chef who cooks for the entire family household). Her Chinese style humba has a distinctive flavor that I can’t remember exactly how she made it. Maybe soon, I’ll post my Chinese style version. So, watch out for it! wow nakakagutom naman. i love it. super like ko yang ulam na yan pero dko alam lutuin ilang beses na ko nagtry. hehehe. In pampanga we call it estopadong pata, but no hard boiled eggs and potatoes. Just a sweet version of sweeten adobo. im from Tanjay, Negros Oriental (midst of Dumaguete City and Bais City)…and my ex mom in law has a native restaurant and when cooking humba she always instruct the kusinera (eatery cook) to use Coke (soda) instead of water…and use Molasses instead of brown sugar and to add 5 tablespoon of ketchup in it and cook it in a low fire. I love the taste. Im living in the states now (Charlotte) and i crave humba the way my mom in law cooked it especially during Fiesta Celebration. 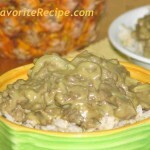 says: i’ll try this one..looks delicious.. hope i cud cook it correctly..thanks for posting this recipe.. I always wanted to have a copy of the recipe humba.I often wonder how it taste,know i know and many thanks to you. I remember my dad using dried lily flowers and salted black beans in his humba. Is this Cebuano style? Yep, I this is a Cebuano Style. Hope you like it! Thanks for visiting. in addition to CEBUANO style of cooking HUMBA, my grandfather will also add a fried banana (sab-a cooking banana) which he will add to the last minute of the cooking time. thats sound good to me, I love humba Even though I’m here at the state theres no filipino knows how to cook our food seldome. as what I remembered theres no potatoes or eggs always salted black beans. but im glad and I search. I love to cook and I love to learn if you have any Idea and i really appreciated. May GOD BLESS YOU! Tried this Humba and my son said it was delicious! Thans for sharing! We call it ‘adobo’ in Luzon… the only difference is the use of sugar… oh but i love humba! i got used to having it when I worked for bosses who all hail from Cebu… now, thanks to your site, I would be able to cook it myself as well (or at least try!) thank you! 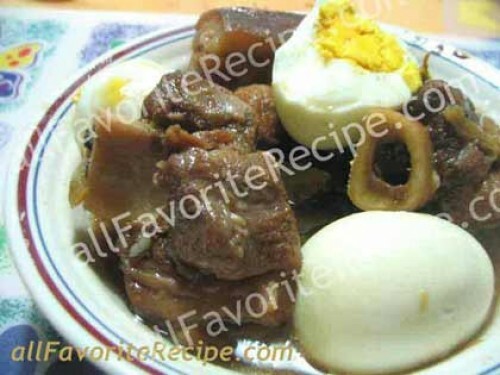 The ingredients are very similar to adobo, except for the brown sugar, potatoes, and hard boiled eggs. I omitted the salt because of the soy sauce. I am proud to introduce our Filipino dishes to my American friends. Thank you at masarap !! This recipe is quite interesting! I can’t wait to try this at home. I think it’s very easy to do and I’m pretty sure that kids will love this because it’s kinda sweet..
We are very excited to cook Humba for the whole family, my wife is filipina from Mindoro so she is learning to cook dishes fromall over thanks to your web-site. We will try other dishes and i am happy to say i love all her cookin g and Filipino cooking makes me sooo malibog!! Thanks a lot. my husband loves it. I had cooked it a few times. Thank you i will try this tonight and i’m sure my kids and my husband will like this. . .
wish for another yummy recipes . .
i’m 13 yrs old n’ im cooking humba!!!! it’s easy n’ yummy! hell yeah! i really don’t know how to cook but because sooner or later when i become married i want to be the one who’ll cook for my family.Now i have another dish that i learned to cook.thanks bro! Gusto ko ang HUMBA nga may violet ubi on the top. 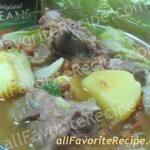 i used to cook humba a kapampangan version. Hi I am a Filipino and been eating this humba recipe. Stumbled upon your website because it’s about time for me to cook for my husband now that I am married. I will be patronizing your site because I promised myself to make a dish weekly for the family. Though its not the original taste that I was looking for but it is at it is, HUMBA. Delicious dish! My family would so enjoy this humba dish, thanks for sharing it!